Every day, large numbers of altruistic individuals, in the absence of any legal duty, provide substantial and essential services for elderly and disabled people. In doing so, many such informal carers suffer financial and other disadvantages. This book considers the scope for a "private law" approach to rewarding, supporting or compensating carers, an increasingly vital topic in the context of an ageing population and the need for savings in public expenditure. Adopting a comparative approach, the book explores the recognition of the informal carer and his or her relationship with the care recipient within diverse fields of private law, from unjust enrichment to succession. Aspects of the analysis include the importance of a promise of a reward from the care recipient and the appropriate measure of any remedy. 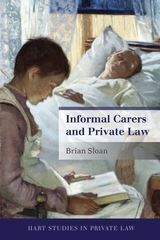 In considering the potential for expansion of a "private law" approach for carers, the book addresses the fundamental and controversial question of the price of altruism. Brian Sloan is College Lecturer, Director of Studies and Fellow in Law at Robinson College, Cambridge.